There is a severe lack of food for the people living in Northwest region of Haiti. The area is desert-like because of the lack of rain plus the lava-like ground condition that makes it almost impossible to grow anything. Most people have only enough food to eat one meal each day...and extreme cases of malnutrition have been found. We felt our best option to help was to partner with Living Water Ministries who have established a school lunch program. Studies show that about 2/3 of the population lives on $2.00 (U.S.) per day. Due to the terrible soil conditions and low access to water, farming is pretty much out of grasp for most of the people. Some along the coast catch a few small fish to eat, others raise a few goats or make charcoal to sell, so they can buy a little rice for their family. Their basic diet is rice; one meal per day per family member. We all know that children are starving all over the world including those in our own backyard. Knowing this can make it seem that no matter what we do, it will never be enough. We tell ourselves that I am only one person. My small donation cannot begin to make a difference, can it? 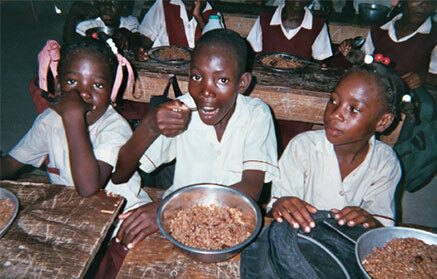 Kerusomen has partnered with Living Water Ministries of the Palm Beaches and their partner, Feed My Starving Children (www.fmsc.org), an organization in Minnesota that helps LWM supply food to the students in Haiti. FMSC has been giving LWM vitamin enriched food since 2007; LWM added rice and beans to increase the quantity each child receives. They also ensure that there are women at every school who prepare the meals in time for lunch. This ensures that the food is eaten by the children and not sold in the marketplace. In the remote villages of NW Haiti, families typically eat one meal per day. Sadly, the amount of food they have is not enough for everyone in the family to satisfy their hunger. By feeding the students at school, the family has more food at home for the adults to eat. The children are healthy. LWM has found that a steady diet of nutritional food every day prevents health issues and increases a student’s ability to study at school. The parents have enough food at home to give them the strength to perform the manual labor it takes to earn a living. Thus they can better provide for other basic necessities their families need, like clothing and medical care. For many of these children, this is the only meal they eat for the day. 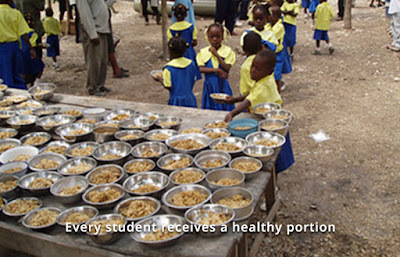 The cost of this Haiti School Lunch Program is Amazingly Low. It only costs $1.00 per day to feed 10 children. Your generous monthly gift will bring HOPE to the Hopeless. Such a small amount of money can actually rescue a child from starvation, giving that child a chance to live a healthy, productive life. 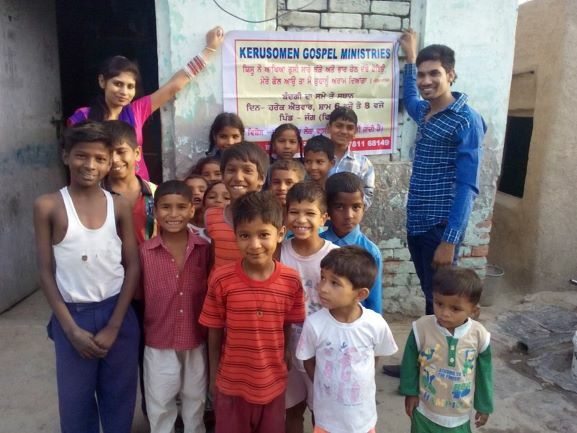 Currently Kerusomen Gospel Ministries is providing 1000 meals each month. This means 45 children are receiving a hot, nutritious meal every single day at school. And you can get in on this marvelous ministry, too. 100% of your donation goes directly to the children's lunches; all program overhead is absorbed by LWM Volunteer Board Members. LWM also has ministry partners that match your donation by 75% which means every $1 you give becomes $4. Thank you for making a dramatic difference in the lives of needy children today! Simply click the donation button below and type "Haiti School Lunch" on your paypal giving slip.